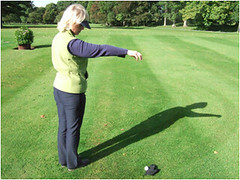 a) May the player play the ball if it touches the glove before striking the course? b) May the player play the ball if it rolls into the glove after striking the course? c) Does the player incur a penalty of one stroke because the ball was deflected by their equipment? d) Must the ball be re-dropped? e) If the ball touches the glove again when it is re-dropped may the player place the ball where it first struck the course? c) No penalty is incurred. If the ball when dropped touches any person or the equipment of any player before or after it strikes a part of the course and before it comes to rest, the ball must be re-dropped, without penalty. There is no limit to the number of times a ball must be re-dropped in these circumstances. A glove is not a "small object" within the meaning of that term in the Definition of "Equipment." Therefore, it is equipment and the ball must be re-dropped. a) Is the ball in play if it touches the tee peg before striking the course? b) Is the ball in play if it rolls into the tee peg after striking the course? 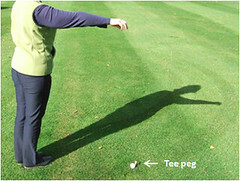 Note: A tee peg is not part of a player's equipment and therefore a dropped ball is in play even if it touches a tee peg that is being used as a marker before it comes to rest. Anything used, worn or carried by the player or anything carried for the player by his partner or either of their caddies, except any ball he has played at the hole being played and any small object, such as a coin or a tee, when used to mark the position of a ball or the extent of an area in which a ball is to be dropped.